Eric always wears a watch: At the gym, on the running path, and especially in the office. Last summer, when the crystal cracked on his ‘work’ watch – a Hugo Boss model – he decided to forego repairing it and instead just buy a brand-new timepiece. Around this time, Eric’s plate was pretty full: He’s an optometrist and was smack-dab in the middle of selling his successful practice. Nevertheless, his occupation and lifestyle came to depend on a watch, so replacing his broken Hugo Boss became a priority on his ‘to-do’ list. With an imminent business deal on the table and a teaching position at a top Optometry School awaiting, Eric was inclined to ‘step up’ the quality of his watch to reflect his personal and professional growth: He toyed with the idea of splurging on a Rolex Submariner. His pragmatic side kicked-in and he thought it a much wiser decision to tip-toe - rather than dive headfirst - into the world of ‘better’ watches. After all, he didn’t really know enough about watches to go ‘all in’ on any one model – particularly one at a Rolex price-point. Also – and perhaps more importantly – Eric was really interested in a watch serving a practical purpose rather than being a pure indulgence: Eric’s number-one criterion was finding an “understated” watch that didn’t come off as “flashy” to his patients. So, Eric decided to pause on a Rolex and just buy a “cheap” watch to hold him over until he felt more comfortable to “proceed with the good stuff!” Although he wanted an inexpensive watch for the interim – he did want a ‘nicer’ watch. He faced a dilemma many of those who are curious about getting into watches often confront: What’s a ‘good’ watch for under $1,000? A $1,000 watch budget doesn’t go as far as it used to. It’s a classic case of ‘a rising tide lifts all boats': As watch collecting gets more popular and record-prices continue to hammer at auctions, the prices and values of watches at every tier and category – from pre-owned and vintage to entry-level and high-end – also increase. But there are still options – as Eric found out when he began his research: He did an Internet search for the “best watches under $1,000.” He was directed to several reviews of mechanical watches costing less-than $1,000. Eric immediately liked the idea of upgrading to a non-quartz watch. He associated it with a degree of sophistication because he remembered his father always ‘winding’ his watch – although he’s not sure if his dad's watch had a manual or automatic movement. With this sample of ‘qualified’ watches, Eric was left to judge based on his needs and taste. As I already mentioned, he was very conscientious about a watch not “standing-out.” He preferred to avoid having patients assume things about him based solely on his choice of watch. Next, he wanted a versatile model: To him that meant a neutral “face” of either white or silver, as well as having the ability to alternate straps between brown and black. Finally, having a date-display was important. 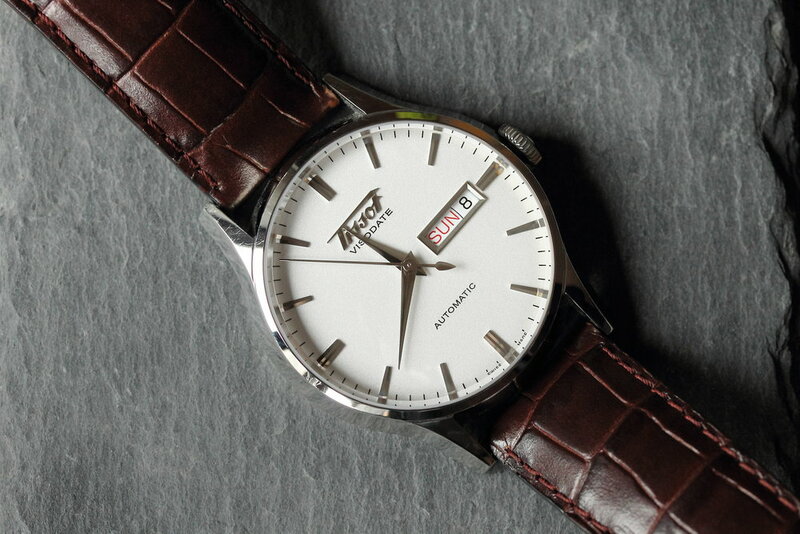 The watch that stood-out to him was the Tissot Heritage Visodate Automatic. The 1950s vintage-inspired look exceeded his requirement for an inconspicuous, classic appearance. Besides this, the milky-dial and brown, crocodile-embossed, leather strap were exactly what he wanted. 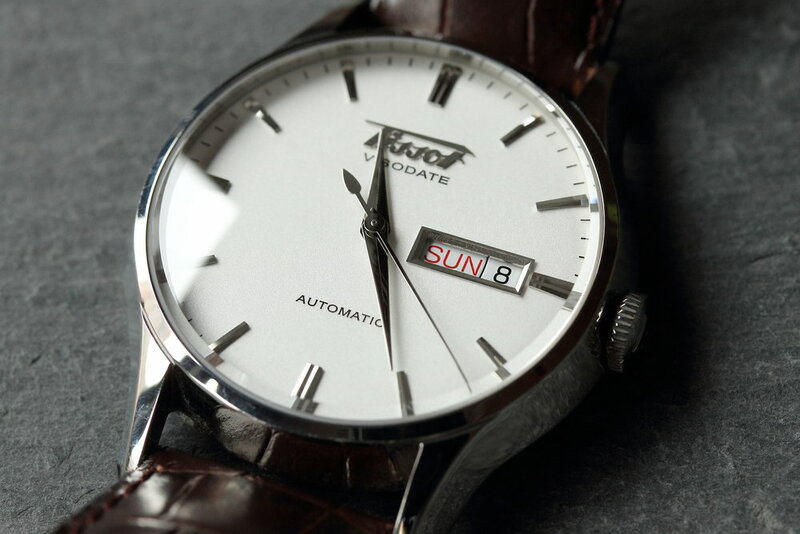 It got even better when it came to the date: the calendar function also showed the day of the week– with ‘Sunday’ printed in red for a subtle – yet striking - contrast. As nice as these surface-level details were, what ‘sealed the deal’ for Eric was the fact that Tissot is a brand with a long history of accomplishments in the field of watchmaking: Since the 1850s Tissot has been credited for numerous innovations and contributions, including developing the first anti-magnetic watch in the 1920s and creating the first watch made of all plastic parts in the 1970s. Nowadays it’s part of the Swatch Group – the world’s largest watch producer and distributor. Because of economies of scale, Swatch can offer Tissot at a very reasonable price. Eric saved money by buying his Tissot through Amazon.com, making the watch’s ‘bang-for-the-buck’ value-element even sweeter. He couldn’t be happier with how easily his Tissot has adapted to his lifestyle: The overall aesthetics are truly a “reflection of him.” The low-key, retro appearance ‘fit the bill’ when it came to blending-in at the office and – most importantly – treating patients. The option to change straps – between brown and black – compliments his personality and style whether day or night, casual or formal. Plus, he “feels good” wearing a watch from a brand steeped in the tradition of watchmaking. Despite having only owned and worn his Tissot for a little over six months, Eric’s early impression is that the watch will “stand the test of time.” The watch he initially thought would simply serve the purpose of holding him over, has actually won him over. So much so that he’s stopped looking at other watches for the time being; although, Eric did just buy bought a boat, so maybe a Submariner is in his near future – or at the very least - something with a ‘sportier’ vibe.